At the Aalto-Musiktheater, Andreas Baesler’s 2009 production is currently revived for a run of three performances. The staging is adequate, but not much more than that. The cast features some very exciting singers, with Katia Pellegrino as an absolutely outstanding Abigaille. Nabucco, which premiered in 1842 at La Scala in Milan, was Verdi’s very first operatic success. 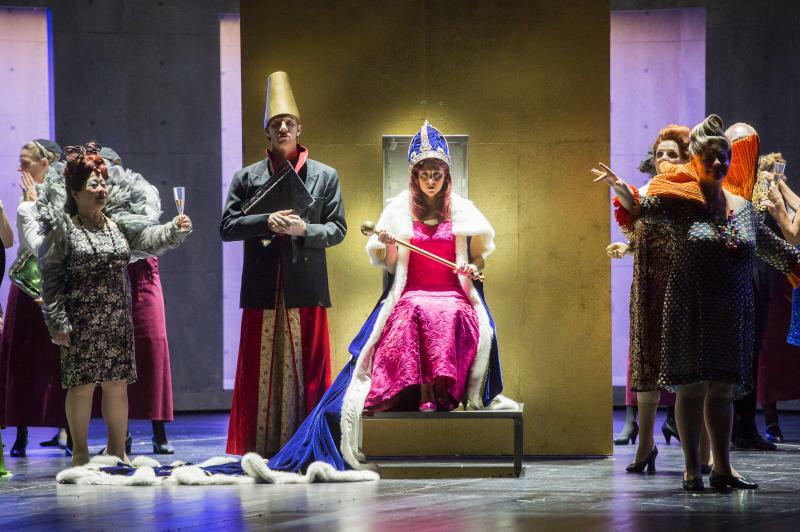 The opera, with a libretto by Temistocle Solera, is based on biblical subject matter and deals with the plight of the Jews as they are assailed in Jerusalem and exiled to Babylonia by the Babylonian king Nabucco (or Nebuchadnezzar II). The historical and biblical events serve as background for a romantic and political plot. After his conquest of the Jews in Judaea, a hubristic Nabucco proclaims himself a god and suddenly loses his sanity. His throne is seized by his illegitimate and malevolent eldest daughter Abigaille, who is in love with the Jewish Ismaele. The fact that Ismaele prefers her younger sister Fenena enrages her. As queen, she tricks Nabucco into signing a warrant ordering the death of the Israelites, including her converted sister Fenena. 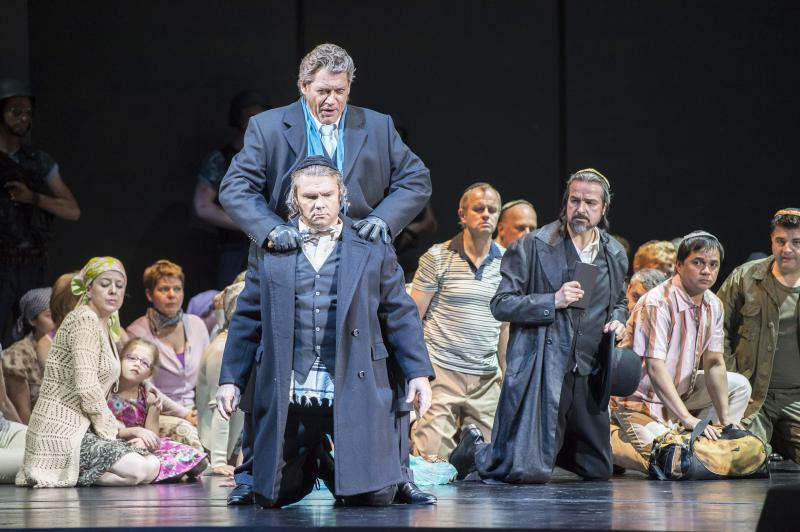 When Nabucco realizes that he has convinced his daughter to death, he calls on the Jewish God in desperation. His sanity is promptly restored to him, he rescues the Jews just in time and orders the removal of false gods. Abigaille, who has poisoned herself, asks for forgiveness and expires. Baesler’s production featured an impressively large grey rotating structure which represented the Temple in Jerusalem and, after some adjustments, the Babylonian palace. The way in which the chorus and characters were positioned in these sets provided some aesthetically pleasing and dramatic tableaux. 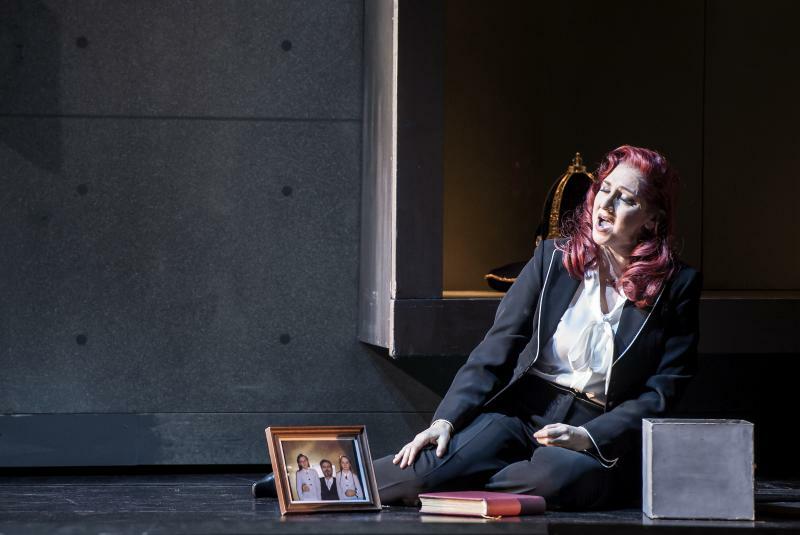 At the same time, that is also where the problem of this production lies: Baesler presents the audience mostly with static tableaux in which the singers deliver their lines rather than with fiery drama. Characterisation and character motivation are not clearly expressed in the staging. So, when Nabucco comes to the Israelites’ rescue, Fenena is standing in the middle of the stage, about to be executed. One would expect the king to embrace – or at least visibly acknowledge – the presence of the daughter he has come to save, and vice versa. Rather puzzlingly, however, Fenena moves toward one side of the stage while Nabucco positions himself at the exact opposite side for the entire final act. The singers and chorus wear modern dress, and the Assyrians are glammed up in colourful, lovely costumes by Alfred Mayerhofer that convey extravagance and luxuriousness. The Israelites, however, are dressed either as orthodox rabbis or as holiday-goers without the slightest bit of fashion sense. When, during ‘va, pensiero…’, the converted Fenena cares for the Israelites, she wears an apron with a blue star of David on it. This seems to suggest some connection to the modern state of Israel, but what is actually intended here is lost on me: Baesler doesn’t seem to take it anywhere. Vocally, the cast is well-assembled. Heiko Trinsinger, a member of the Aalto-musiktheater ensemble since 1999, sings a regal and intensely human Nabucco. He may not have the vocal qualities of a true, classic ‘Verdi baritone’, but his performance is excellent nonetheless. 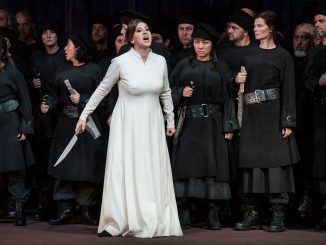 As Nabucco’s daughter Abigaille, the Italian soprano Katia Pellegrino returns to Essen after her great success as Norma earlier this season. Her voice and temperament fit the demanding role of Abigaille like a glove. She magnificently combines a talent for the finer intricacies of bel canto singing with a talent for producing the hysterical, angry sounds that a convincing Abigaille also needs to produce. 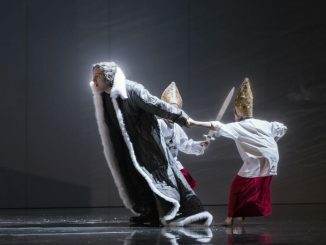 Bass-baritone Almas Svilpa sung an excellently dark-sounding Zaccaria and conveyed the zealousness and authority of the high priest convincingly. As Fenena, mezzo-soprano Bettina Ranch showed yet again what a valuable addition she is to the Essener ensemble. Her voice sounds warm and her sense of bel canto is impeccable. It’s a pity that Fenena’s lover was not as strongly-cast. As Ismaele, Jeffrey Dowd seemed somewhat out of place. His voice sounded somewhat rough, and rather unsuited to the Italian repertoire. His costume certainly did not help and made him look more like a phlegmatic theologian than a passionate lover. After a rocky start in the first act, the chorus pulled itself together and sung excellently. Under the baton of Lithuanian conductor Modestas Pitrénas, the Essener Philharmoniker played Verdi’s orchestral score with just the right amount of dynamism and colour.